English poet, statesman and soldier, eldest son of Sir Henry Sidney and his wife Mary Dudley, he was born at Penshurst on the 30th of November 1554. His father, Sir Henry Sidney, was three times lord deputy of Ireland, and in 1560 became lord president of Wales. Philip Sidney's childhood was spent at Penshurst; and before he had completed his tenth year he was nominated by his father lay rector of Whitford, Flintshire. A deputy was appointed, and Philip enjoyed the revenue of the benefice for the rest of his life. On the 17th of October 1564 he was entered at Shrewsbury school, not far from his father's official residence at Ludlow Castle, on the same day with his lifelong friend and first biographer, Fulke Greville. An affectionate letter of advice from his father and mother, written about 1565, was preserved and printed in 1591 (A Very Godly Letter...). In 1568 Sidney was sent to Christ Church, Oxford, where he formed lasting friendships with Richard Hakluyt and William Camden. But his chief companion was Fulke Greville, who had gone to Broadgates Hall (Pembroke College). Sir Henry Sidney was already anxious to arrange an advantageous marriage for his son, who was at that time heir to his uncle, the earl of Leicester; and Sir William Cecil agreed to a betrothal with his daughter Anne. But in 1571 the match was broken off, and Anne Cecil married Edward Vere, 17th earl of Oxford. In that year Philip left Oxford, and, after some months spent chiefly at court, received the queen's leave in 1572 to travel abroad "for his attaining the knowledge of foreign languages." He was attached to the suite of the earl of Lincoln, who was sent to Paris in that year to negotiate a marriage between Queen Elizabeth and the duc d'Alençon. He was in the house of Sir Francis Walsingham in Paris during the massacre of Saint Bartholomew, and the events he witnessed no doubt intensified his always militant Protestantism. In charge of Dr. Watson, dean, and afterwards bishop, of Winchester, he left Paris for Lorraine, and in March of the next year had arrived in Frankfurt-am-Main. He lodged there in the house of the learned printer Andrew Wechel, among whose guests was also Hubert Languet. Fulke Greville describes Philip Sidney when a schoolboy as characterized by "such staidness of mind, lovely and familiar gravity, which carried grace and reverence far above greater years." "Though I lived with him, and knew him from a child", he says, "yet I never knew him other than a man." These qualities attracted to him the friendship of grave students of affairs, and in France he formed close connections with the Huguenot leaders. Languet, who was an ardent supporter of the Protestant cause, conceived a great affection for the younger man, and travelled in his company to Vienna. In October Sidney left for Italy, having first of all entered into a compact with his friend to write every week. This arrangement was not strictly observed, but the extant letters, more numerous on Languet's side than on Sidney's, afford a considerable insight into Sidney's moral and political development. Languet's letters abound with sensible and affectionate advice on his studies and his affairs generally. Sidney settled for some time in Venice, and in February 1574 he sat to Paolo Veronese for a portrait, destined for Languet. His friends seem to have feared that his zeal for Protestantism might be corrupted by his stay in Italy, and Languet exacted from him a promise that he would not go to Rome. In July he was seriously ill, and immediately on his recovery started for Vienna. From there he accompanied Languet to Poland, where he is said to have been asked to become a candidate for the vacant crown. On his return to Vienna he fulfilled vague diplomatic duties at the imperial court, perfecting himself meanwhile, in company with Edward Wotton, in the art of horsemanship under John Pietro Pugliano, whose skill and wit he celebrates in the opening paragraph of the Defence of Poesie. He addressed a letter from Vienna on the state of affairs to Lord Burghley, in December 1574. In the spring of 1575 he followed the court to Prague, where he received a summons to return home, apparently because Sir Francis Walsingham, who was now secretary of state, feared that Sidney had leanings to Catholicism. His sister, Mary Sidney, was now at court, and he had an influential patron in his uncle, the earl of Leicester. He accompanied the queen on one of her royal progresses to Kenilworth, and afterwards to Chartley Castle, the seat of Walter Devereux, earl of Essex. There he met Penelope Devereux, the "Stella" of the sonnets, then a child of twelve. Essex went to Ireland in 1576 to fill his office as earl marshal, and in September occurred his mysterious death. 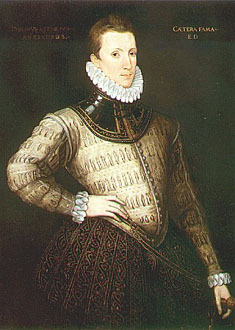 Philip Sidney was in Ireland with his father at the time. Essex on his deathbed had desired a match between Sidney and his daughter Penelope. Sidney was often harassed with debt, and seems to have given no serious thought to the question for some time, but Edward Waterhouse, an agent of Sir Henry Sidney, writing in November 1576, mentions "the treaty between Mr. Philip and my Lady Penelope." In the spring of 1577 Sidney was sent to congratulate Louis, the new elector Palatine, and Rudolf II, who had become emperor of Germany. He received also general instructions to discuss with various princes the advancement of the Protestant cause. After meeting Don John of Austria at Louvain, March 1577, he proceeded to Heidelberg and Prague. He persuaded the elector's brother, John Casimir, to consider proposals for a league of Protestant princes, and also for a conference among the Protestant churches. At Prague he ventured on a harangue to the emperor, advocating a general league against Spain and Rome. This address naturally produced no effect, but does not seem to have been resented as much as might have been expected. On the return journey he visited William of Orange, who formed a high opinion of Sidney. In April 1577 Mary Sidney married Henry Herbert, 2nd earl of Pembroke, and in the summer Philip paid the first of many visits to her at her new home at Wilton. But later in the year he was at court defending his father's interests, particularly against the earl of Ormonde, who was doing all he could to prejudice Elizabeth against the lord deputy. Sidney drew up a detailed defense of his father's Irish government, to be presented to the queen. A rough draft of four of the seven sections of this treatise is preserved in the British Museum (Cotton MS., Titus B, XII, pp. 557-59), and even in its fragmentary condition it justifies the high estimate formed of it by Edward Waterhouse. Sidney watched with interest the development of affairs in the Netherlands, but was fully occupied in defending his father's interests at court. He came also in close contact with many men of letters. In 1578 he met Edmund Spenser, who in the next year dedicated to him his Shepherdes Calendar. With Sir Edward Dyer he was a member of the Areopagus, a society which sought to introduce classical metres into English verse, and many strange experiments were the result. In 1578 the earl of Leicester entertained Elizabeth at Wanstead, Essex, with a masque, The Lady of the May, written for the occasion by Philip Sidney. But though Sidney enjoyed a high measure of the queen's favor, he was not permitted to gratify his desire for active employment. He was already more or less involved in the disgrace of his uncle Leicester, following on that nobleman's marriage with Lettice, countess of Essex, when, in 1579, he had a quarrel on the tennis court at Whitehall with the earl of Oxford. Sidney proposed a duel, which was forbidden by Elizabeth. There was more in the quarrel than appeared on the surface. Oxford was one of the chief supporters of the queen's proposed marriage with Alençon, now duc d'Anjou, and Sidney, in giving the lie to Oxford, affronted the leader of the French party. In January 1580 he went further in his opposition to the match, addressing to Elizabeth a long letter in which the arguments against the alliance were elaborately set forth. This letter, in spite of some judicious compliments, was regarded, not unnaturally, by the queen as an intrusion. Sidney was compelled to retire from court, and some of his friends feared for his personal safety. A letter from Languet shows that he had written to Elizabeth at the instigation of "those whom he was bound to obey", probably Leicester and Walsingham. Sidney retired to Wilton, or the neighboring village of Ivychurch, where he joined his sister in writing a paraphrase of the Psalms. Here too he began his Arcadia, for his sister's amusement and pleasure. In October 1580 he addressed a long letter of advice, not without affectionate and colloquial interruptions, to his brother Robert, then about to start on his continental tour. This letter was printed in Profitable Instructions for Travellers (1633). It seems that a promise was exacted from him not to repeat his indiscretions in the matter of the French marriage, and he returned to court. In view of the silence of contemporary authority, it is hardly possible to assign definite dates to the sonnets of Astrophel and Stella. Penelope Devereux was married against her will to Robert, Lord Rich, in 1581, probably very soon after the letter from Penelope's guardian, the earl of Huntingdon, desiring the queen's consent. The earlier sonnets are not indicative of overwhelming passion, and it is a reasonable assumption that Sidney's liking for Penelope only developed into passion when he found that she was passing beyond his grasp. Mr. A. W. Pollard assigns the magnificent sequence beginning with No. 33 -- "I might! unhappy word -- O me, I might, / And then would not, or could not, see my blisse" to the period following on Stella's reappearance at court as Lady Rich. It has been argued that the whole tenor of Philip's life and character was opposed to an overmastering passion, and that there is no ground for attaching biographical value to these sonnets, which were merely Petrarchan exercises. That Sidney was, like his contemporaries, a careful and imitative student of French and Italian sonnets is patent. He himself confesses in the first of the series that he "sought fit words to paint the blackest face of woe", by "oft turning others' leaves" before he obeyed the command of his muse to "look in his heart and write." The account of his passion is, however, too circumstantial to be lightly regarded as fiction. Pollard sees in the sonnets a description of a spiritual struggle between his sense of a high political mission and a disturbing passion calculated to lessen his efforts in a larger sphere. It seems certain, at any rate, that he was not solely preoccupied with scruples against his love for Stella because she was already married. He had probably been writing sonnets to Stella for a year or more before her marriage, and he seems to have continued to address her after his own marriage. Thomas Nashe defined the general argument epigrammatically as "cruel chastity -- the prologue Hope, the epilogue Despair." But after Stella's final refusal Sidney recovered his earlier serenity, and the sonnet placed by Pollard at the end of the series -- "Leave me, 0 Love, which reachest but to dust" -- expresses the triumph of the spirit. Meanwhile he prosecuted his duties as a courtier and as member for Kent in parliament. On the 15th and 16th of May 1581 he was one of the four challengers in a tournament arranged in honor of the visit of the duke of Anjou. In 1579 Stephen Gosson had dedicated to Sidney his School of Abuse, an attack on the stage, and incidentally on poetry. Sidney was probably moved by this treatise to write his own Apologie for Poetrie, dating from about 1581. In 1583 he was knighted in order that he might act as proxy for Prince John Casimir, who was to be installed as Knight of the Garter, and in the autumn of that year he married Frances, daughter of his friend and patron Sir Francis Walsingham, a girl of fourteen or fifteen years of age. In 1584 he met Giordano Bruno at the house of his friend Fulke Greville, and two of the philosopher's books are dedicated to him. Sidney was employed about this time in the translation from the French of his friend Du Plessis Mornay's treatise on the Christian religion. He still desired active service and took an eager interest in the enterprises of Martin Frobisher, Richard Hakluyt and Sir Walter Raleigh. In 1584 he was sent to France to condole with Henri III on the death of his brother, the duke of Anjou, but the king was at Lyons, and unable to receive the embassy. Sidney's interest in the struggle of the Protestant princes against Spain never relaxed. He recommended that Elizabeth should attack Philip II in Spain itself. So keen an interest did he take in this policy that he was at Plymouth about to sail with Sir Francis Drake's fleet in its expedition against the Spanish coast (1585) when he was recalled by the queen's orders. He was, however, given a command in the Netherlands, where he was made governor of Flushing. Arrived at his post, he constantly urged resolute action on his commander, the earl of Leicester, but with small result. In July 1586 he made a successful raid on Axel, near Flushing, and in September he joined the force of Sir John Norris, who was operating against Zutphen. On the 22nd of the month he joined a small force sent out to intercept a convoy of provisions. During the fight that ensued he was struck in the thigh by a bullet. He succeeded in riding back to the camp. The often-told story that he refused a cup of water in favor of a dying soldier, with the words, "Thy need is greater than mine", is in keeping with his character. He owed his death to a quixotic impulse. Sir William Pelham happening to set out for the fight without greaves, Sidney also cast off his leg-armor, which would have defended him from the fatal wound. He died twenty-five days later at Arnheim, on the 17th of October 1586. The Dutch desired to have the honor of his funeral, but the body was taken to England, and, after some delay due to the demands of Sidney's creditors, received a public funeral in St. Paul's Cathedral on the 16th of February 1587. Sidney's death was a personal grief to people of all classes. Some two hundred elegies were produced in his honor. Of all these tributes the most famous is Astrophel, A Pastoral Elegie, added to Edmund Spenser's Colin Clout's Come Home Again (1595). Spenser wrote the opening poem; other contributors are Sidney's sister, the countess of Pembroke, Lodowick Bryskett and Matthew Roydon. In the bare enumeration of Sidney's achievements there seems little to justify the passionate admiration he excited. So calm an observer as William of Orange desired Fulke Greville to give Elizabeth "his knowledge and opinion of a fellow-servant of his, that (as he heard) lived unemployed under her... If he could judge, her Majesty had one of the ripest and greatest counsellors of estate in Sir Philip Sidney, that this day lived in Europe" (Fulke Greville, Life of Sidney). His fame was due first of all to his strong, radiant and lovable character. Shelley placed him in Adonais among the "inheritors of unfulfilled renown", as "sublimely mild, a spirit without spot." Sidney left a daughter Frances, who married Roger Manners, earl of Rutland. His widow, who, in spite of the strictures of some writers, was evidently sincerely attached to him, married in 1590 Robert Devereux, second earl of Essex, and, after his death in 1601, Richard de Burgh, earl of Clanricarde. Sidney's writings were not published during his lifetime. A Worke concerning the trewnesse of the Christian Religion, translated from the French of Du Plessis Mornay, was completed and published by Arthur Golding in 1587. The Countesse of Pembroke's Arcadia written by Philippe Sidnei (1590), in quarto, is the earliest edition of Sidney's famous romance. A folio edition, issued in 1593, is stated to have been revised and rearranged by the countess of Pembroke, for whose delectation the romance was written. She was charged to destroy the work sheet by sheet as it was sent to her. The circumstances of its composition partly explain the difference between its intricate sentences, full of far-fetched conceits, repetition and antithesis, and the simple and dignified phrase of the Apologie for Poetrie. The style is a concession to the fashionable taste in literature which the countess may reasonably be supposed to have shared; but Sidney himself, although he was no friend to euphuism, was evidently indulging his own mood in this highly decorative prose. The main thread of the story relates how the princes Musidorus and Pyrocles, the latter disguised as a woman, Zelmane, woo the princesses Pamela and Philoclea, daughters of Basilius and Gynaecia, king and queen of Arcady. The shepherds and shepherdesses occupy a humble place in the story. Sidney used a pastoral setting for a romance of chivalry complicated by the elaborate intrigue of Spanish writers. Nor are these intrigues of a purely innocent and pastoral nature. Sidney described the passion of love under many aspects, and the guilty queen Gynaecia is a genuine tragic heroine. The loose framework of the romance admits of descriptions of tournaments, Elizabethan palaces and gardens and numerous fine speeches. It also contains some lyrics of much beauty. Charles I recited and copied out shortly before his death Pamela's prayer, which is printed in the Eikon Basilike. John Milton reproached him in the Eikonoklastes with having "borrowed to a Christian use prayers offered to a heathen god... and that in no serious book, but in the vain amatorious poem of Sir Philip Sidney's Arcadia." Professor Courthope (History of English Poetry) points out that the tragedy of Sidney's life, the divorce between his ideals of a nobly active life and the enforced idleness of a courtier's existence, is intimately connected with his position as a pioneer in fiction, in which the life represented is tacitly recognized as being contrary to the order of existence. Sidney's wide acquaintance with European literature is reflected in this book, but he was especially indebted to the Arcadia of Jacopo Sannazaro, and still more to George Montemayor's imitation of Sannazaro, the Diana Enamorada. The artistic defects of the Arcadia in no way detracted from its popularity. Both Shakespeare and Spenser were evidently acquainted with it. John Day's Ile of Guls, and the plots of Beaumont and Fletcher's Cupid's Revenge, and of James Shirley's Arcadia, were derived from it. The book had more than one supplement. Gervase Markham, Sir William Alexander (earl of Stirling) and Richard Beling wrote continuations. The series of sonnets to Stella were printed in 1591 as Sir P.S. : His Astrophel and Stella, by Thomas Newman, with an introductory epistle by Thomas Nashe, and some sonnets by other writers. In the same year Newman issued another edition with many changes in the text and without Nashe's preface. His first edition was (probably later) reprinted by Matthew Lownes. In 1598 the sonnets were reprinted in the folio edition of Sidney's works, entitled from its most considerable item The Countesse of Pembroke's Arcadia, edited by Lady Pembroke, with considerable additions. The songs are placed in their proper position among the sonnets, instead of being grouped at the end, and two of the most personal poems (possibly suppressed out of consideration for Lady Rich in the first instance), which afford the best key to the interpretation of the series, appear for the first time. Sidney's sonnets adhere more closely to French than to Italian models. The octave is generally fairly regular on two rhymes, but the sestet usually terminates with a couplet. The Apologie for Poetrie was one of the additions to the countess of Pembroke's Arcadia (1598), where it is entitled "The Defence of Poesie." It first appeared separately in 1594 (unique copy in the Rowfant Library, reprint 1904, Cambridge University Press). Sidney takes the word "poetry" in the wide sense of any imaginative work, and deals with its various divisions. Apart from the subject matter, which is interesting enough, the book has a great value for the simple, direct and musical prose in which it is written. The Psalmes of David, the paraphrase in which he collaborated with his sister, remained in manuscript until 1823, when it was edited by S. W. Singer. A translation of part of the Divine Sepmaine of G. Salluste du Bartas is lost. There are two pastorals by Sidney in Davison's Poetical Rhapsody (1602). Letters and Memorials of State... (1746) is the title of an invaluable collection of letters and documents relating to the Sidney family, transcribed from originals at Penshurst and elsewhere by Arthur Collins. Fulke Greville's Life of the Renowned Sir Philip Sidney is a panegyric dealing chiefly with his public policy. The Correspondence of Sir Philip Sidney and Hubert Languet was translated from the Latin and published with a memoir by Steuart A. Pears (1845). The best biography of Sidney is A Memoir of Sir Philip Sidney by H. R. Fox Bourne (1862).